Ooooh...check out these groovy gadgets that HG sniffed out! 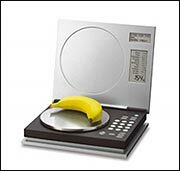 This super-cool computerized food scale has a database chock-full of nutritional info on more than 1,400 foods. So when you plop a handful of grapes on it, you’ll not only find out their weight but also the exact amount of calories, fat grams, etc. that specific portion contains. And, it gets better. You can program nutritionals for up to 100 extra products/ recipes into the database. You can even track your total daily intake & set dietary goals/ limits, too! We love this scale so much it hurts. Available online; click here to compare prices! We’ve done our research, and this is without a doubt the easiest indoor garden kit on the market. It’s a fully automated, self-feeding, garden-growing sensation! Not only is there no dirt involved (yay! ), but the system automatically adjusts the lighting for best results & REMINDS you when to water it. Use it to grow your own lettuce, herbs and veggies. The Aerogarden comes with a FREE Salad Greens Seed Kit, which will get you started growing seven different types of lettuce. In no time you’ll be boasting about the salad you grew in your own (countertop) garden. They are currently only available online. It should be illegal for kitchenware to be this cute. 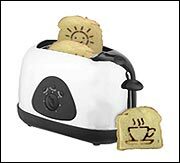 This groovy toaster (available in a variety of colors) actually imprints little messages and pictures on your toastables! Serve up snowflake-emblazoned english muffins or “LUV U” touting toast! There are even themed ones available with kooky statements like “Bite Me!” and “Boys R Smelly.” This could be used as a dieting device, too, 'cuz food this cute shouldn't be eaten! Click here to find out how to get one. Frankly (pun intended! ), this one’s a little frightening. But we just had to include it. This wacky device slices ordinary hot dogs into eight-legged sea creatures. Cook ‘em, and their little legs swirl around the body like tentacles. Decorate them with condiments and eat 'em, or put on a hot dog variety show for the neighbors! We can't wait to turn guilt-free dogs into various and sundry sea critters. Yippeee! Purchase ‘em online here. Today, August 31st, is National Trail Mix Day. Whoop it up with our It's Trail Mix, Baby! For a printable text-only version of this email, click here.